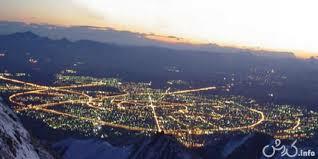 Hamadan province is located in the western part of the country with an area of more than 19,000 square kilometers. It is bounded on the north by the province of Zanjan, on the south by lorestan, on the east by the central province and on the west by Kermanshah and Kurdistan. Hamadan is a beautiful highland covered with huge mountains and green slopes, farmlands, pastures, snow-capped peaks and fertile valleys under a blue sky. The highest and the most famous peak in Hamadan is Alvand with a height of 3574 meters and a legendary and historical fame no less than that of Damavand. Hamadan is a cold province with long winters where there is snow in the mountains for eight months of the year. This gives the province very mild summers and a green natural setting. Based on the latest statistical surveys the population of Hamadan province is about 1,758,000 (2011) people of various ethnic origins with their own special cultures and traditions. Almost all the population is Muslim. In different areas they speak Persian, Turkish, Lori, Laki and Kurdish, however, all of them understand and speak Persian. The population of Hamadan province is distributed in the 6 cities of Hamadan (capital of the province), Malayer, Nahavand, Twiserkan, Kabudarahang and Assadabad as well as their various districts and villages. The occupation of city dwellers is either administrative or industrial services and in other parts of the province agriculture constitutes the people‘s main 32 business. The capital city of the province is linked, by main roads, to Ghazvin, Tehran, Kermanshah (and the western parts of the country), Malayer, Borujerd (and the southern areas) and Saveh (and the country‘s central regions). Let‘s begin the visit to Hamadan province from the historical city of Hamadan. HAMADAN IN THE COURSE OF HISTORY Hamadan is one of the oldest cities of not only Iran but of the world. Its historical origins date back to several centuries BC. Hamadan, which was the summer capital of the Median and Achaemenid, was then called Ekbatan or Hegmataneh, meaning a place of assembly. Hamadan is one of the cradles of Oriental civilization with legendary background. According to historical records, there was once a castle in this city by the name of Haft Hessar (Seven Walls) which had a thousand rooms and its grandeur equaled that of the Babylon Tower. All the nations living around Iran coveted the prominent natural position of Hamadan from the times immemorial until recent centuries; and have invaded the city several times. First, the Assyrians destroyed Hamadan. It was ruined again and again during the invasion of Mongols and Tamerlane. Finally, in the recent centuries the Ottomans attacked the city several times, but Hamadan heroically stood against the enemies and courageously withstood all the losses it had sustained. Hamadan is the homeland of great scholars and men of letters like Einolghozati, Khajeh Rashid din Fazlollah, Adham Hamadani, Baba Taher Oryan and Mirzadeh Eshghi, and the tombs of Avicenna and Baba Taher are located in this city. Hamadan has preserved its importance in the post-Islamic period. THE SIGHTS OF HAMADAN Hamadan is a city of mild climate. Its natural beauty including that of Mount Alvand and its beautiful peak as well as the scenery of Morad Baig and Abbass abad valleys will always be remembered by visitors .In this ancient city remains have been unearthed in archaeological excavations of Median and Achaemenid castles, fortresses and cities on the hills of Hegmataneh and Masala. The objects unearthed in those sites, like tablets, gold and silver plates, and tools are now in great museums.